This dressage whip has a black nylon threaded shaft with leather handle and engraved Aluminum cap. The price includes the engraving. It is available with either a black or white handle in 39", 42" or 47" lengths. 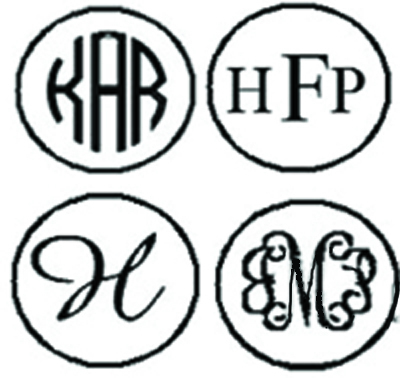 Monogramming styles are: Upright script (for a large single letter), circle stye, 3 letter interlaced, or 3 letter basic. PLEAS NOTE: This product can take several minuted to be processed into the shopping cart due to the number of variations to be calculated. Please be patient. THanks! Select Length 39" 42" 47"